I am now going to promise that I will post on this blog at LEAST once a week. Please keep reading. Now I'm doing this for me and not for you but knowing someone is counting on my posts will give me motivation. Ideally you should eat when you are at a 3 and finish when you are at a 7. I tend to stop at a 7.5 and sometimes an 8. Stopping at an 8 is ok - REMEMBER this is a learning experience!!! 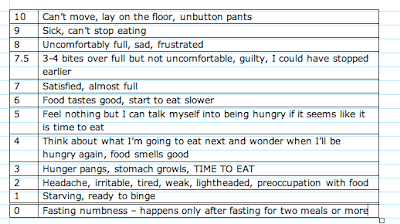 I've been eating before I get hungry - like I thought I could talk myself into it when I was at a four or a five. I was looking at the clock and deciding I should be hungry so I'd eat. 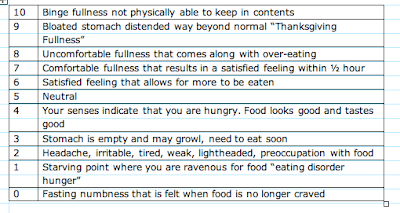 Let me tell you that if you eat when you are not hungry it is really hard to stop when you are full because there is not really a contrasting feeling - do you know what I mean? I was eating at a 4 or even a 5 and then having a hard time knowing when to stop. Here is part of the problem for me: I'll be coming home from work and think - what am I going to have for dinner? Then I'd have to figure out some place to pick up some food on the way home cause I knew I didn't have much at home. Well I wasn't hungry but I didn't want to go home and then have to go out again. It finally occured to me that I should go to the grocery store and buy food to prepare for when I was hungry. It is so key to have good food on hand so you will have something you want to eat WHEN you are hungry. So I know now I should WAIT until I am at a 3 to eat. Hi Katy! Thanks for giving me the link to your blog (in response to my post on the Intuitive Eating Yahoo group). I'll add your blog to my Blogroll and read your posts! Thanks Kelly - I like your blog!